The rocks that form the sides of the Seaway go down to about five to seven metres and it is then sand. This then slopes deeper in some parts. There are two pipes that exit the wall on the southern side. One is the sand by-pass pipe. This transfers sand from the ocean pier you can see south of the breakwater across the Seaway to the ocean beach north of the northern breakwater. This is to counteract the barrier created by the breakwater that over the years before the sand pumping structure was installed caused the beach south of the breakwater to build up with sand and the one north to diminish. The other pipe is the sewage treatment outfall for the Gold Coast. More about this later. To find this location, head to Surfers Paradise and from the main north-south road, take the road that leads to Sea World. This is well signposted and it also has a sign pointing to The Spit. Go along the waterfront past the first marina, take the left access from the roundabout and head north past Sea World and Sea World Resort. A short distance past this you will come to a large carpark on your right and then the road comes to a T-intersection. Immediately to your left and ahead is a small carpark. Park your car here if there is a spot or park as close as you can in the main carpark. This dive is done on the high tide. It is very important that you follow this for a number of reasons. First, the current gets very strong here. Second, the sewage pipe discharges treated effluent after high tide (see later). Make sure that you enter the water as close as you can to high tide and certainly not too far after the high. 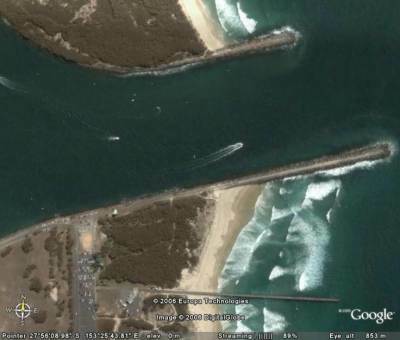 Walk over to the spot indicated in the satellite photo and you will see that there is a concrete platform stretching a short distance into the water. This is above the sewage pipe. This is the best entry and exit point. Gear up and walk down to this spot (it can be a little difficult getting throught the boulders but there is a well worn track). Once at the end of the concrete cover to the pipe, either put your fins on and flop (do not giant stride) in off the end or go down the western (left) side and put your fins on. Note that some of the larger cruisers that pass can make quite big waves which can knock you over. 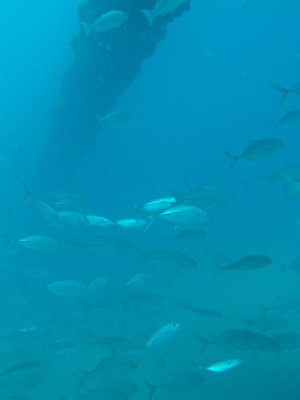 Once in the water, drop below the surface and head to the east towards the sand pipe. On the bottom you will be at about seven metres. There will undoubtably be a current coming towards you and it may be fairly strong. Keep as close to the bottom as you can and use your hands in the sand to pull yourself along. You will see a pipe coming across from the east. Follow this, keeping below the pipe. Soon you will see the sand pipe. This at first looks like a huge prop-shaft coming out of the back of a ship, but as you get closer you will see that it disappears off to your left. The pipe is supported every 10 metres or so by a large pylon. In some spots the pipe is about three to four metres off the sand but it can get as close as 0.5 metre (between the sand and the bottom of the pipe). To keep out of the current, you can either keep on the sand itself or up next to the pipe. However, when alongside the pipe, you will find that the current is less, but that you may get buffeted from above and/or below as the current flows around the pipe. Almost straight away you will see huge numbers of fish. The main ones are big-eye trevally and bream. 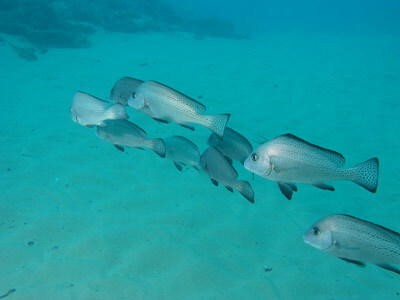 The trevally can stretch from the sand to above the pipe and cover an area of more than 20 metres by 10 metres. 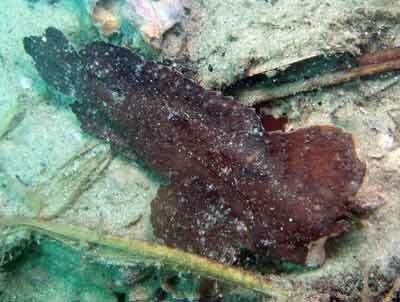 As well, you will see some large whiting on the sand and even some very large flathead. As you go along, you will see that there is a wall of sand to the east. At times this also gives a bit of protection, as does each of the supporting pylons. 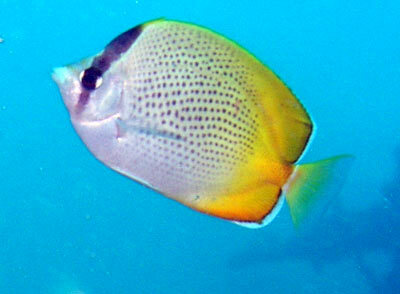 Around the pylons you will see lotws of tropical fish. 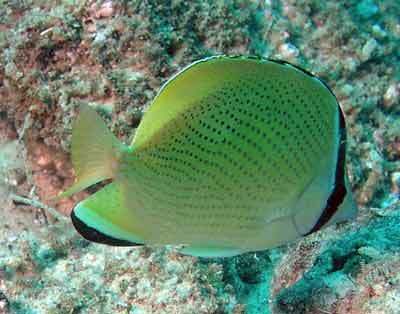 These include maori cod, Gunthers butterflyfish, speckled butterflyfish, starry pufferfish and more. You will also see in the rubble under some of the pylons eels and octopus. A couple of pylons out you will see that there is a large tree laying under the pipe. 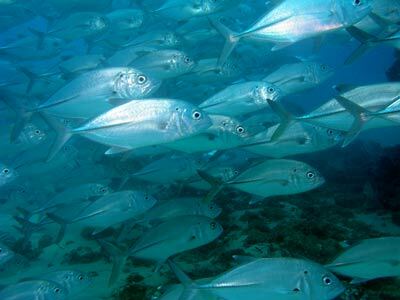 This is home to some more tropical fish and also the trevally and bream tend to congregate here as well. The depth drops a bit more from here to about 15 metres. This is the deepest you will normally get on the dive. At the next pylon you can head to the east if the current is not too strong. About 40 to 50 metres along up over the sand ridge there is an outcrop of "coffee" rock. This is a brown smooth (and soft) rock that is also in small bits near the pipe. This spot is home to numbers of eagle rays. Also seen here are jewfish. Note that the current must be very slight to enable you to get to this location without too much effort. Once finished here, you can head back to the pipe by going a bit to the north of west. This will save you the effort of swimming across the current in at least one direction. Go out a couple more pylons and you will see that the sand comes back up a little to perhaps 14 metres. If you venture past here it can get to 16 metres but the water can get dirtier as the incoming tide can bring the dirty water that was expelled from the waterway on the outgoing tide. Head back along the pipe towards the shore and two pylons past the tree, head west and after about 30 metres you will see the sewage pipe. This is quite short, only extending out about 40 metres from the shore. You will see that every five metres or so there is a large supporting column. On the eastern side of the pipe you will that at every column there is a horizontal pipe that points east. These are the discharge pipes for the sewage. The sewage is supposed to start discharging about 75 minutes after high tide but on the two days I dived here it was far earlier, less than 40 minutes after high tide. I would recommend staying well clear when you get near 45 minutes after high tide or you will cop a face full of xxxx. So long as you keep upcurrent of the pipe once the discharge starts, you will be okay. From here you can go west a little and you may see lots of sand whiting. Back near the pipe in about nine metres there is a cockatoo waspfish (like a very small red Indianfish) living among the small rocks. Again, in this area there are lots more tropical fish. Exit the water by climbing back onto the sewerage pipe from the western side. After you exit the water, you can wash the sand and salt off you using the shower next to the tree above the sand pipe. This is a truely great dive site, well worth doing numerous times. 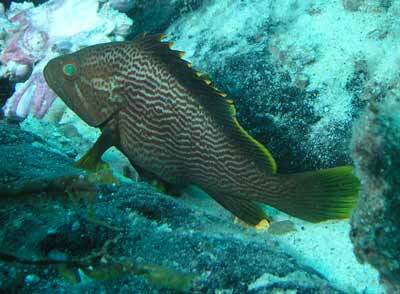 However, it is not really for very inexperienced divers unless under close supervision by more experienced divers. I would recommend using a large tank, even though it is only shallow, as the current can mean that your air consumption can get quite high, even for very good breathers. Michael and Kelly would like to thank Ian Banks of Dive the Gold Coast for the loan of tanks and weights, including air fills.